Britni from Play. Party. Pin. is here today with a recipe for you all today. Hi! 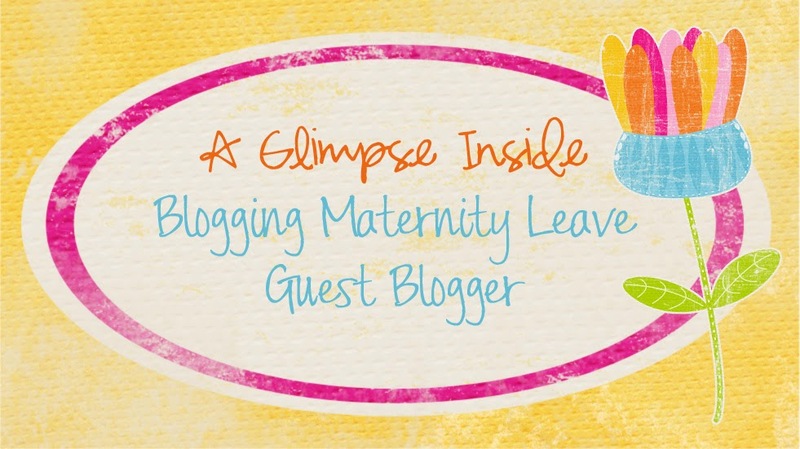 I am Britni and I blog over at Play. Party. Pin. I am so excited to be guest posting for Allison while she snuggles with that sweet little girl of hers. I am a stay-at-home to a seven-month old boy who just decided he doesn't want to stay put anymore and crawls all over the place. When I'm not chasing my little one, I love planning and hosting parties. My blog is all about my party ideas from recipes, to crafts, to the perfect game to go with your party theme. I'd love it if you wanted to stop by my blog sometime to say hi. I am not a huge fan of pumpkin pie so when Thanksgiving rolls around I am always looking for pumpkin desserts that aren't pumpkin pie. So today I'm sharing a recipe for pumpkin lovers who don't love pumpkin pie, pumpkin delight. One of my all-time favorite desserts is striped delight, a combination between chocolate pie and cheesecake. It starts with a yummy graham cracker crust topped with a cream cheese mixture, chocolate pudding, and finally whipped cream on top. It's a family favorite and my go-to dessert recipe for pretty much any occasion. 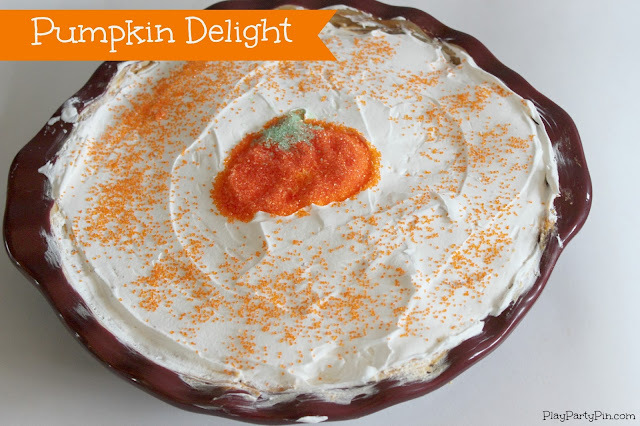 The recipe I'm sharing with you today is a pumpkin version of that dessert, which is why I call it pumpkin delight. Mix cream cheese, 1 T milk, and 2 T sugar in a large bowl with a mixer until well blended. Gently fold in half of the whipped topping. 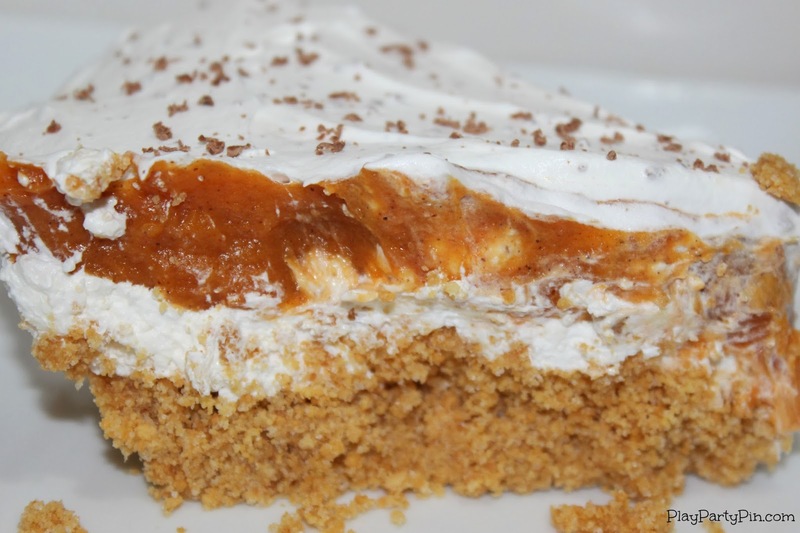 Spoon over graham cracker crust. Pour 1 cup milk into large bowl. Add pumpkin, dry instant pudding mixes, pumpkin pie spice, and mix until well combined. Pour over cream cheese layer. Refrigerate pie for 4 hours or until set. Thanks so much for sharing Britni! I also love Striped Delight so this is right up my alley! Looks absolutely fantastic! I love pumpkin and cream cheese! Pinning to try soon! Christine, it is delicious. I've been sneaking little bites all week. Looks delicious! I could eat pumpkin food all day long! Looks delicious!! Congrats on the little one Allison.